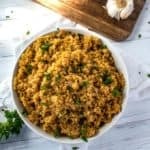 Become a quinoa pro! 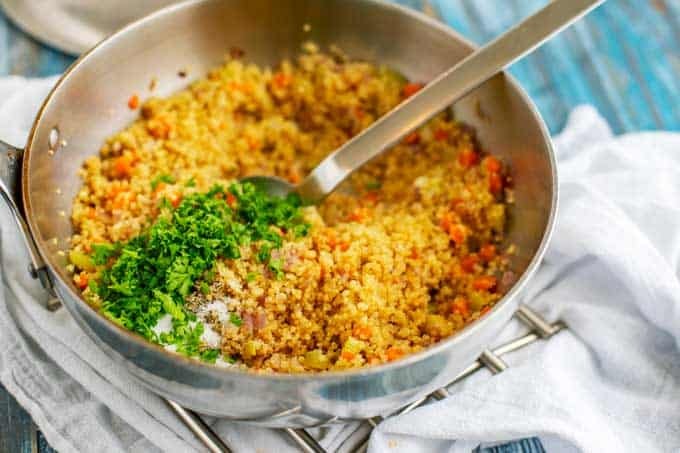 Learn how to cook quinoa with these helpful tips and tricks that will enable you to make it perfectly on your stove top every time. You know this superfood is good for you, and now it is time to master it. 2.2 What is the Best Ratio for Quinoa to Water? 4.2 How Do You Make Quinoa Taste Good? 4.4 How Do You Rinse Quinoa? 4.6 Can You Eat It Raw? 4.7 What is the Serving Size? 4.8 Can I Grow Quinoa? 4.9 How Do You Pop Quinoa? 4.10 What Are The Calories in Cooked Quinoa? 4.11 How Long Can You Store Cooked Quinoa in the Refrigerator? I don’t know about you, but quinoa wasn’t a food that I grew up eating. Although today I’ve written two quinoa cookbooks and authored over 1,000 recipes, I only first heard of the seed in 2010. I fell in love the first time I cooked it and was thrilled that my picky pre-school boys dove into it as well. Then I tried to make it again. It turned out like mush. Like a lot of people, our relationship started a little rocky. It was clear that if I was going to make this super-seed a regular part of my diet, I needed to learn How to Cook Quinoa. In the last nine years, I’ve made quinoa hundreds if not thousands of times. In the process, I’ve learned a thing or two. 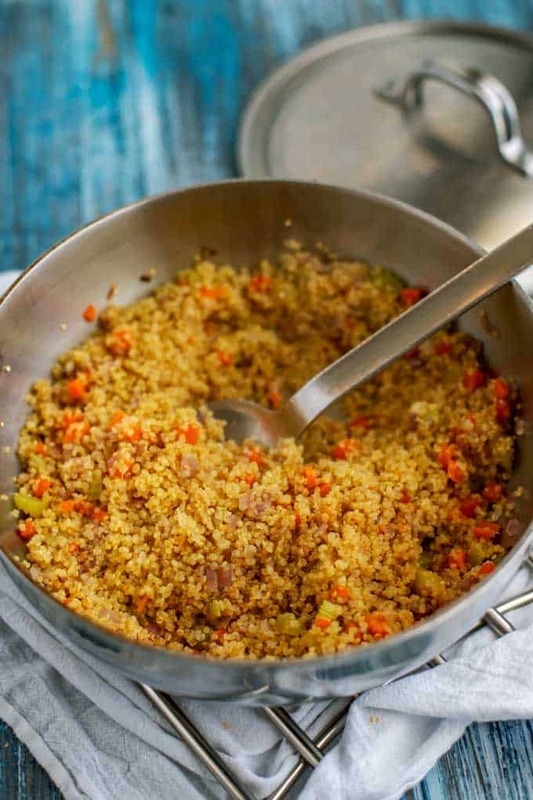 Here are my best tips and tricks for cooking quinoa. There is a simple reason why so many people struggle to learn how to cook quinoa. Most methods of cooking it call for a 1:2 ratio between seeds and liquid. For a long time, I thought this was the best method, but I still struggled from time to time with it turning out mushy. My struggles lead to a bit of experimentation. What I found is that I like it a lot more when I used less liquid, lower heat, and cooked it for longer. What is the Best Ratio for Quinoa to Water? Unlike some methods which yield a softer (and sometimes soggy!) 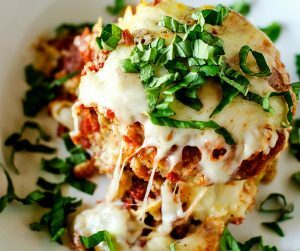 quinoa, this technique makes it fluffy every time. The first thing you want to do is gather your ingredients. Chop your veggies and measure everything out. Cooking quinoa with aromatics adds so much flavor! Quinoa absorbs flavor from what you cook with it, so start by sautéing a cup of aromatics in a tablespoon of oil for 6 to 8 minutes. Good options include onions, celery carrots, and bell pepper. For extra flavor, you can also add in a teaspoon of minced fresh ginger or a tablespoon of diced Jalapeno. While the aromatics are cooking, rinse 1 cup of quinoa in a fine metal strainer for 3 to 5 minutes, until the water runs clear. Toasting quinoa adds an extra nutty flavor! When the aromatics are done cooking, add another tablespoon of oil to the pot. Toast the quinoa for 2 to 3 minutes. Layer on the flavor by cooking in broth. Add 1 1/4 cups of broth to the pan cover and bring to a simmer. Reduce the heat to low, and cook covered for 30 to 35 minutes. For optimum flavor, never cook in water — homemade broth with yield the best flavor. 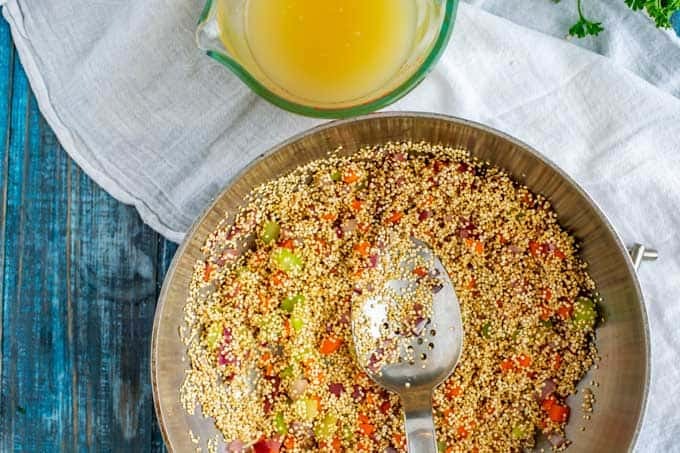 Fluff your quinoa before adding in herbs and seasonings. Stir in herbs and seasonings and allow to sit covered for 5 minutes! When the quinoa is done, add a 1/2 teaspoon of salt and pepper and 2 tablespoons of fresh herbs to the pot. Stir and cover and allow to sit for another 5 minutes. Chenopodium quinoa is a member of the goosefoot family. Although you often hear it referred to as a grain, this is incorrect. 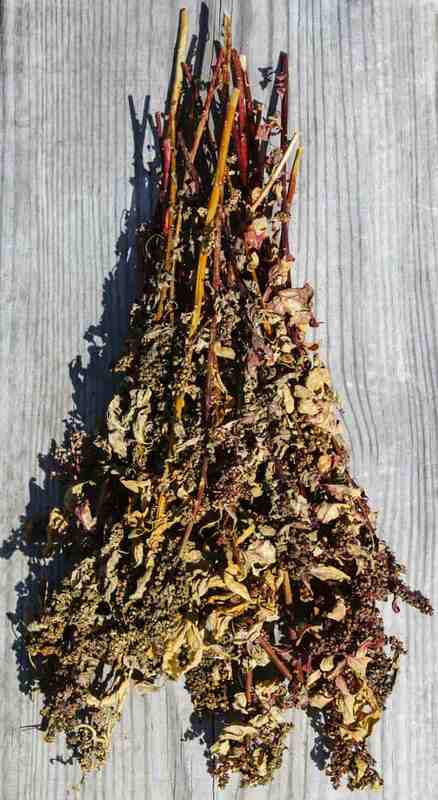 It is a seed that is related to plants like beet, chard, spinach and the edible weed lambs quarters. Although the leaves can be eaten in the same way that you can eat spinach or chard leaves, it is the seeds that we commonly refer to. There are different kinds, including white, red, and black. The most commonly found in grocery stores is white. If you were to classify it, the correct classification is a pseudo-grain, that is, a non-grain that is treated like a grain in cooking. One of the best things about it is that it is non-GMO and has not been hybridized. In a world where GMO’s should be a major concern for all of us, its purity makes it an attractive staple part of our diets. You can learn more about quinoa by reading The Quinoa Chronicles, a book by Stephen Gorad, who brought quinoa to the United States. Read about the health benefits of it here. How Do You Make Quinoa Taste Good? Season it well when cooking. It is great at absorbing flavors – I like to think of it as a blank slate. You can make it taste infinitely better by seasoning it well when cooking. I like to add in salt, pepper, and garlic powder for savory preparations, and cinnamon and nutmeg for breakfast or any other sweet dish. Don’t cook it in water! Depending on how I’m planning on using it, I always cook it in broth, water, milk or juice. 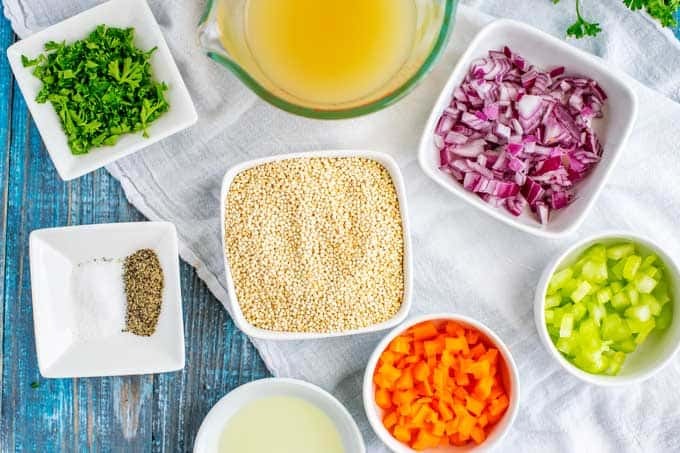 Homemade broth is a game changer when you cook quinoa because it is so packed with flavor. Add in Vegetables. Adding in sautéed onion, peppers, and garlic is also helpful when you are struggling with how to make it taste good. Use it in recipes. It is always going to be best in a recipe. You can check out my collection of quinoa recipes. In its natural state, it is bitter. That is because it is covered with a bitter substance called saponin. Saponin works as a natural protectant, fending off pests. While this is a good thing while it is growing, it is important to rinse it well before cooking. In addition to making it taste bitter, saponin can cause gastrointestinal distress. To avoid an upset stomach and a bitter dish, rinse it 3 to 5 minutes before cooking. I always rinse it, even if the package says it is pre-rinsed. It should not be bitter when rinsed. The best tool I’ve found is a fine metal strainer. If you don’t have a strainer that is fine enough to rinse quinoa, you can use cheesecloth to line your strainer. I find this to be a bit cumbersome, but it does work. Another option is a nut milk bag. (Just make sure it gets washed well so that any nut milk you make in the future doesn’t have saponin on it. Do not skip rinsing! It is the number one step that people have skipped when they ask me how to make quinoa taste good because they have tried it and it was terrible. Place it over a bowl or the pot you plan to cook in. Rinse until the water runs clear, about 3 to 5 minutes. The best way to cool it is to place it on a parchment lined baking sheet. Allow it to cool completely before putting it in the refrigerator. I do not eat it raw, but I adore it rinsed well and either toasted in the oven or popped. While popped quinoa does not expand in the same way that popcorn does, it gains a light texture that makes it perfect for sprinkling over salads or yogurt. It can also be a fantastic textural element to soup. That depends on where you live. It thrives in sandy alkaline soil that is considered poor for most crops. It loves high elevation and tolerates both freezing and the sun. The reason it is so frost resistant is the size of the germ, which is much larger than other grains. (Though remember, it isn’t a grain.) it is native to Peru and Bolivia, but in the last twenty years, it has been grown in many countries. It is now grown in Colorado and Canada, but a large portion of commercially available quinoa is still imported from South American. How Do You Pop Quinoa? You may be surprised to know that you can pop it in the same way that you can pop popcorn. It is one of my favorite suggestions for people when they ask me how to make quinoa that their kids will eat. Though it doesn’t bulk up in the same what that popcorn does, it does expand slightly and experiences a fairly dramatic change in texture. It kind of reminds me of really small and slightly firmer rice krispies! This method allows you to pop it without oil. 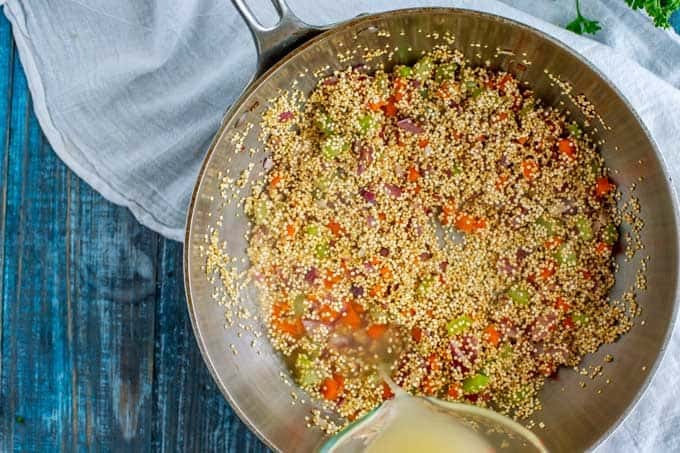 Heat a large skillet to high heat and add quinoa in a single layer, being careful not to crowd. As the kernels begin to pop, shake your pan . After 30 seconds to 1 minutes, remove the pan from the heat. Allow it to sit in the pan for a minute more, watching to make sure it isn’t burning. Transfer to another dish to prevent burning. Because all stoves heat a little differently, you may need to turn the heat down to avoid burning. I love to use my electric (not Air) popcorn popper to pop quinoa. Plug your popcorn popper in and add a tablespoon of coconut oil. When the oil melts, add your quinoa and cover. Shaking every 10 seconds or so, pop it until it starts to turn golden brown. Unplug your popper and transfer to a separate dish to avoid burning. What Are The Calories in Cooked Quinoa? Each cup has 220 calories. How Long Can You Store Cooked Quinoa in the Refrigerator? 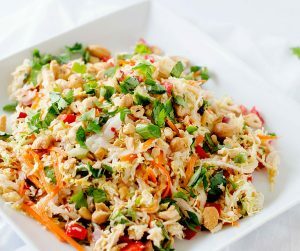 You may safely store it in the refrigerator for up to five days. Know that it is good for you, but aren't quite sure how to cook it? If you want perfect fluffy quinoa, read on to learn how to cook it. Get my best cooking tips and find out how to make it taste great every time. Add onion, celery, and carrots and cook for 6 to 8 minutes, until tender. 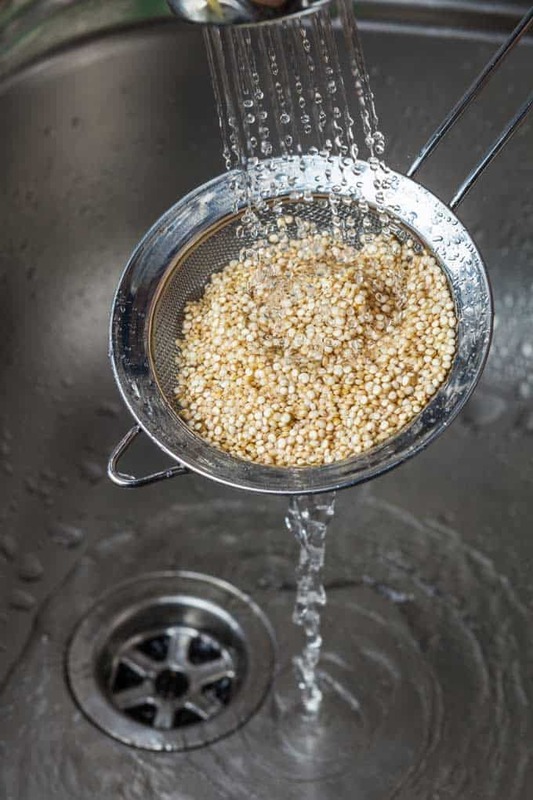 While the aromatics are cooking, rinse quinoa in a fine metal strainer with running water for 3 to 5 minutes, or until the water runs clear. If the saucepan is dry, add another tablespoon of oil. Add quinoa and toast it for 3 to 4 minutes. Add broth to the pan. Bring to a simmer and then reduce to low. Cover and cook for 30 to 35 minutes or until the liquid is absorbed. Turn of the heat, and season with salt and pepper. Stir in 2 tablespoons of fresh herbs if desired. Let sit covered for an additional five minutes. Fluff and add to your favorite dishes. How to Cool It: If you are going to be sorting in the refrigerator, place on a rimmed baking sheet and allow to cool before transferring to a storage container. One thing that I have found is that even if you have only 15 minutes to cook your quinoa and want to use the boil/simmer method, it tends to work better if you use a little less water. Note: This is not my preferred method to cook quinoa and I only use this if I am short on time and don't have access to my Instant Pot. You can check out my post on Instant Pot Quinoa for another alternative. Reduce the heat to medium-low, cover and simmer for 15 minutes. Remove from heat and allow to sit covered for 5 minutes. If not eating right away, allow it to cool completely before storing in the refrigerator. Over the last two years, I've developed the habit of cooking a large batch of quinoa once a week so that I can easily throw it into anything from wraps, pancakes, and salads. My fridge is almost never without it. Although I love the method above, sometimes I just want something fast that doesn't require measuring. This is a no-fuss way to cook quinoa, but again, it is not my preferred method. Rinse your quinoa and place in a large pot of water. Drain and return quinoa to the pot. Cover and let is sit off the heat for 10 minutes. Followed your recipe for perfect Quinoa with one exceptions. After it was soaked and rinsed, I put a little olive oil in the pan and toasted the Quinoa then added the water and cooked. It came out just as perfect as you said! It was so light and fluffy! Thanks so much! Are you sure? 30-35 minutes, then the quinoa is all mushy. I don’t like that. The soaking and rinsing is OK in my opinion, but not the cooking. I cook it for 10 minutes in more water or broth than it can absorb, then drain it and let it sit in the hot pan for 5 minutes. Always perfect, because with the absorption method yuo never can tell if it’s just right. It depends on the moisture of the quinoa. After 600+ quinoa recipes….yes I’m sure this works. This works because you don’t bring it to a boil – just a simmer. If you bring it to a boil and then cook it for 30 minutes it will be overcooked and mushy. what about boiling the Quinoa and than steaming it? You can cook it that way! I sometimes do if I am short on time. You can delete this post if you like. 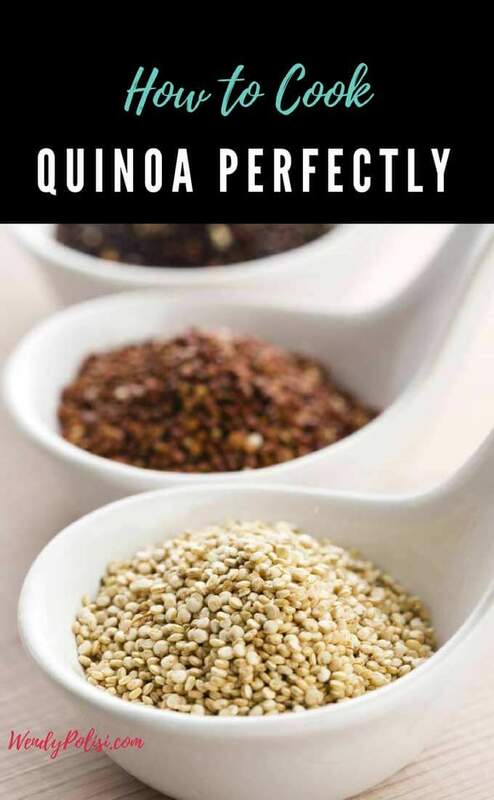 I would love to perfect this in the Insta-pot – you can toast in that also – anybody use it and get perfect quinoa? This was amazing. Thanks so much! thanks for an amazing recipe. The rinsing part is vital as I discovered the first time I made quinoa. I did not rinse it and it tasted so gross. Do you know I have never tried quinoa, both making and eating. But I may just have to change that and follow these tips thank you. i had a Vegan co-worker ages ago who was definitely obsessed with Quinoa and she also preferred using broth to water. 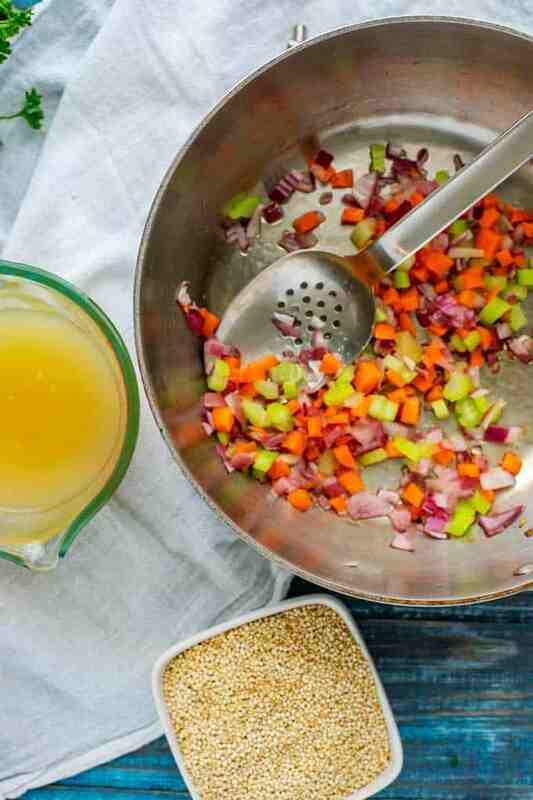 This is a great overview on how to best prepare quinoa. 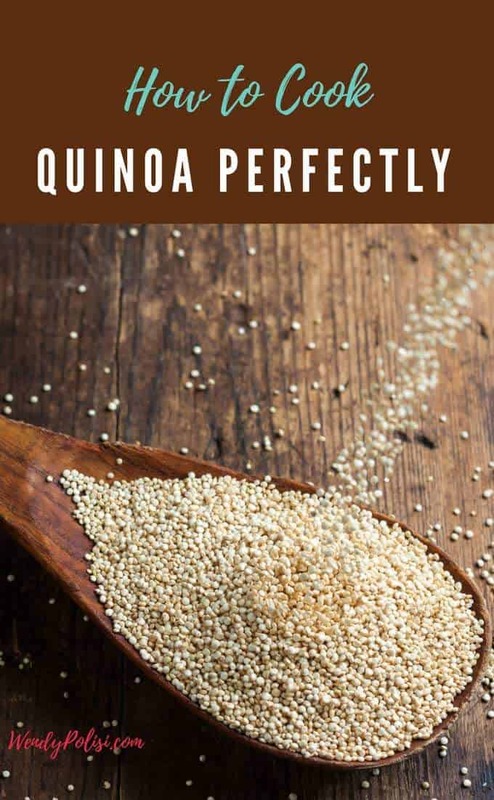 I love the flavor and texture of quinoa but I have always thought it was hard to make a perfect batch. I will try your method next time. I will be saving this post for sure. I have never attempted cooking Quinoa simply because nearly every cooking show makes it seem like the Mt. Everest of dishes to get right. Perhaps they are wrong ? One of the reasons why I dont cook quinoa is because it can be too dry or too soft. I’m going to try the 1:1:25 ratio and add a bit less water and lowering the flame a bit. Good to know the ratio. I too do not care for mushy quinoa. Another super easy way to make quinoa is in the oven. I put the quinoa and broth in a glass baking dish and cover tightly with foil. Bake at 350 F for about 40 minutes. Then take it out and let it sit (covered) for about 20 minutes more. Fluff and serve! Especially good and healthy with a can of black beans (drained and rinsed) and a diced up sweet potato added to the baking dish before cooking. This makes great burritos. I love quinoa but I always find it heavy. I guess it’s like rice in that respect. I love buffalo quinoa bowl though! I’ve only made quinoa once, and I THINK it was okay. Now I’m questioning myself, ha! I remember the first time I ever tried to cook quinoa. I put it in the oven thinking it would cook. A half hour later, the grains were still as hard and grainy as before. That’s when I realized that I had to cook it like I would rice. Since then, quinoa has become a favorite around here. I may be one of the few remaining people left to not try QUINOA before. I really need to do it. It sounds amazing. Thank you Wendy. Life changer! I have actually never tried quinoa before but I will have to try making it sometime soon. I have never had quinoa, nor have I ever really heard of it before. It looks very interesting thouhg, I’m going to have to try this out sometime. Thanks for sharing! This is very informed. I would have no idea where to start when it comes to quinoa. The article says 1:1.75 ratio, the recipe has 1:1.25 – which is it? Hi Megan, If you read, there are two different methods depending on how much time you have. My preferred method is the one that uses less water, but you can use more if you are short on time. Like the way you organize the information. It’s very easy to catch up! Thanks for sharing.